- The show opened with Shane McMahon saying he's proud of everyone from Smackdown Live, except for two people. He brought out Kevin Owens and Sami Zayn, who traded barbs with McMahon, until Shane prepared to fire them. As he was about to do so, he was interrupted by Daniel Bryan. 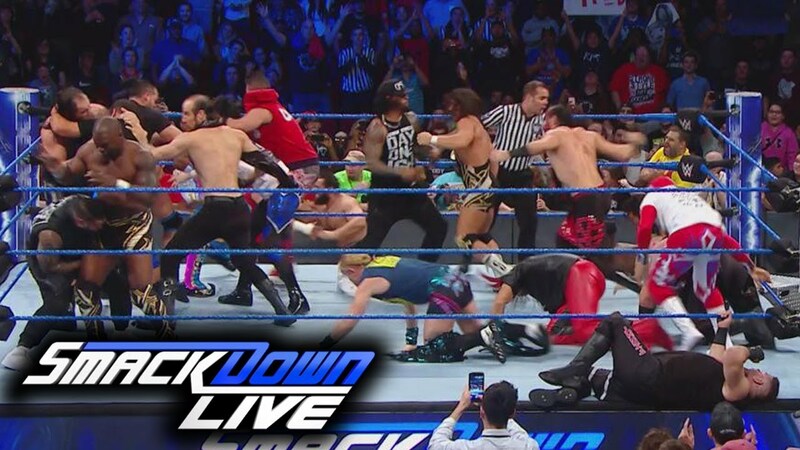 Bryan suggested punishing them rather than firing them, and booked them against the New Day in a lumberjack match. 1. Shelton Benjamin defeated Jey Uso. Benjamin hit Paydirt and pinned Jey. - Backstage, Naomi was getting her makeup done when she was attacked by the debuting Ruby Riot, Sarah Logan, and Liv Morgan from NXT. Becky Lynch tried to make the save and was also beaten down. - Backstage, Shane McMahon told Daniel Bryan that punishing Owens and Zayn was a great idea, then left Bryan in charge before leaving for the evening. 2. The Bludgeon Brothers defeated the Hype Bros. The Bludgeon Brothers finally debuted, with new music and ring gear. They hit a two-man Splash Mountain on Mojo Rawley, and Erick Rowan got the pin. - AJ Styles praised Brock Lesnar, and said he'd beat him in the sequel, like Rocky. Styles challenged Jinder Mahal to a title fight, but Mahal appeared on the video board and said his rematch would take place at Clash of Champions. The Singh Brothers jumped Styles from behind, but Styles turned the tables, hit a Styles Clash, and posed with his title. 3. Smackdown Women's Championship Match: Natalya defeated Charlotte Flair (c). Natalya won by disqualification when Ruby Riot, Liv Morgan, and Sarah Logan jumped the guardrail and attacked Natalya on the outside. They then entered the ring and beat down Charlotte. 4. Lumberjack Match: Kevin Owns and Sami Zayn defeated the New Day. The lumberjacks all brawled through the ring and backstage. Zayn took advantage of the confusion to roll up Kofi Kingston for the pin. - After the match, Kevin Owens fled through the crowd. The New Day surrounded Zayn in the ring and attacked him, then hit him with the Midnight Hour. Backstage, Owens begged Bryan not to fire them, and Bryan said he never intended to fire them, and that Owens has a singles match against Randy Orton next week.